Caribbean GeoTextile Tubes are comparatively small geotextile containers use for erosion control, Hurricane Storm Protectionand breakwater "soft armored" structures. They are environmentally aesthestic and the soft sand color helps them blend into the environment. These GeoTextile Bags are filled hydraulically with a small pump or mechanically with sand. Soft armored GeoTextile Bags are used instead of stone or rock to protect coastlines in the Bahamas, Dominican Republic, Jamaica, Virgin Islands, Trinidad and Tobago, Aruba, St. Lucia and other Caribbean countries. Using GeoTextile Bags is more cost effective than building hardened armor structures with stone or block and is less intrusive to the environment in the Caribbean. Installation of GeoTextile Bags are simple whether placing above and below the water surface Environmental irrigation and flood control, river bank Sediment soil stabilization, soil conservation, Shoreline coastal beaches erosion control, Hurricane Storm Protection Cost savings are also a factor when choosing the geotextile bags over a hardened structure. 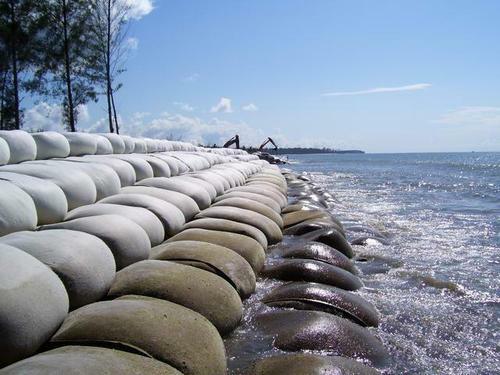 The GeoTextile Bags are made of a high strength woven GeoTextile fabric that is UV resistant for longevity and offer easy construction methodology for the Bahamas, Turks & Caicos or Trinidad and Tobago projects. Our geotextile bags are equipped with a unique proprietary flat, self-sealing port for filling. The port does not require the fill hose be secured during the filling process and has a clean, finished appearance once the bag is filled. Use of our great looking, well designed bags is fast becoming industry standard. Contact SDMI dba Caribbean GeoTextiles with any questions you may have on your next project in the Caribbean.